Driven by the demand to optimize aircraft performance, decrease operating and maintenance costs, increase dispatch reliability, and reduce gas emissions - have underscored the aircraft industry's renewed push toward the concept of more electric aircraft (MEA), and ultimately an all electric aircraft. Specifically, the MEA concept provides for the utilization of electric power for all non-propulsive systems. Traditionally these non-propulsive systems are driven by a combination of different secondary power sources such as hydraulic, pneumatic, mechanical and electrical. Recent technological advances in the field of power electronics, fault-tolerant architecture, electro-hydrostatic actuators, flight control systems, high density electric motors, power generation and conversion systems have ushered the era of the MEA. 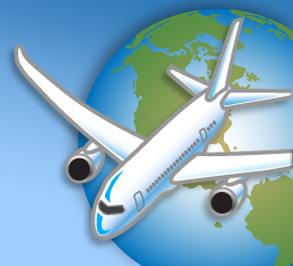 This trend is accelerating, as aircraft OEMs collaborate with their suppliers to design new systems and implement new electrical-intensive architectures. Adoption of the MEA concept is seen as critical enabler for the aircraft industry to unlock significant improvements in terms of aircraft weight, fuel consumption, total life cycle costs, maintainability and aircraft reliability. Redefining power systems towards a more electric aircraft. Aeroval, Inc./StarterGenerator.com® shall retain all rights, title and interest to it’s moreelectricaircraft.com website including all intellectual property rights therein and thereto. Aeroval®, StarterGenerator.com® and other related graphics, logos, images, service names and service marks are trademarks of Aeroval, Inc.
StarterGenerator.com® is a U.S. registered mark owned by Aeroval, Inc. Aeroval® is a U.S. registered mark owned by Aeroval, Inc. All logos, brands, trademarks and registered trademarks appearing on this website are the property of their respective owners. Seller and Buyer shall indemnify, defend, and hold harmless Aeroval, Inc. (MoreElectricAircraft.com) and it's employees, agents, successors, officers, and assigns, from any suits, losses, claims, demands, liabilities, costs and expenses (including attorney and accounting fees) that Aeroval, Inc. (MoreElectricAircraft.com) may sustain or incur arising from (a) the Buyer's use of any products purchased from Aeroval, Inc. (MoreElectricAircraft.com) or Sellers/Advertisers through use of this website, (b) Aeroval, Inc. (MoreElectricAircraft.com)'s or the Seller/Advertister's or Buyer's, as applicable, alleged failure or failure to comply with any applicable laws and regulations or to obtain any licenses or approvals from the appropriate government agencies necessary to purchase and use or sell the products, (c) Aeroval, Inc. (MoreElectricAircraft.com)'s or the Seller/Advertiser's or Buyer's, as applicable, alleged breach or proven breach of any obligations set forth in these Terms, (d) any inaccuracy, error, delay, or omission, non-performance, interruption of information due either to any negligent act or omission by Aeroval, Inc. (MoreElectricAircraft.com) or its Users/Sellers/Suppliers/Advertisers or to any "force majeure" (i.e. flood, extraordinary weather conditions, earthquake, or other act of God, fire, war, insurrection, riot, labor dispute, accident, action of government, communications, power failure, or equipment of software malfunction) or any other cause beyond the reasonable control of Aeroval, Inc. (MoreElectricAircraft.com) or its Users, Sellers, Suppliers, Advertisers. AEROVAL, INC. (MOREELECTRICAIRCRAFT.COM) PROVIDES ITS WEBSITE AND PRODUCTS "AS IS", WITHOUT WARRANTY OF ANY KIND. AEROVAL, INC. (MOREELECTRICAIRCRAFT.COM) DISCLAIMS ALL WARRANTIES OR REPRESENTATIONS REGARDING MATERIAL SOLD OR INFORMATION PROVIDED, WHETHER EXPRESSED OR IMPLIED, INCLUDING THE IMPLIED WARRANTIES OF MERCHANTABILITY, FITNESS FOR A PARTICULAR PURPOSE, NONINFRINGEMENT OR TITLE. AEROVAL, INC. (MOREELECTRICAIRCRAFT.COM) SHALL NOT UNDER ANY CIRCUMSTANCES BE LIABLE TO BUYERS, SELLERS, SUPPLIERS, ADVERTISERS, AN OTHER CONTENT PROVIDERS OR USERS OF THE WEBSITE FOR ANY DAMAGES OF ANY KIND ARISING FROM THE USE OF AEROVAL, INC. (MOREELECTRICAIRCRAFT.COM) WEBSITE, INCLUDING BUT NOT LIMITED TO INDIRECT, SPECIAL, CONSEQUENTIAL, EXEMPLARY OR INCIDENTAL DAMAGES. AEROVAL, INC. (MOREELECTRICAIRCRAFT.COM) RESERVES THE RIGHT TO ADD, REMOVE, OR AMEND CONTENT TO/FROM THE WEBSITE AT ITS OWN DISCRETION, WITHOUT PRIOR NOTICE. AEROVAL, INC. (MOREELECTRICAIRCRAFT.COM) ASSUMES NO RESPONSIBILITY FOR THE ACCURACY OF THE INFORMATION CONTAINED ON THE AEROVAL, INC. (MOREELECTRICAIRCRAFT.COM) WEBSITE. CONTENT IS GATHERED ON A VOLUNTARY BASIS AND IS BELIEVED TO BE ACCURATE AT TIME OF SUBMISSION. CONTENT IS REVIEWED AND VERIFIED TO THE BEST OF AEROVAL, INC.
(MOREELECTRICAIRCRAFT.COM)'S ABILITY BEFORE ADDING TO THE WEBSITE. AVAILABILITY OF MATERIAL AND CONTENT ON THE WEBSITE IS SUBJECT TO PRIOR SALE AND/OR WITHDRAWAL, AT THE DISCRETION OF EITHER AEROVAL, INC. (MOREELECTRICAIRCRAFT.COM) OR THE SUPPLIER OF THE MATERIAL AND/OR CONTENT. 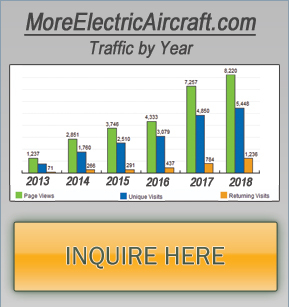 Aeroval, Inc./MoreElectricAircraft.com provides links to 3rd party companies, products, services and websites operated by others. 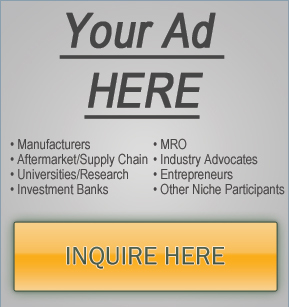 Aeroval, Inc./MoreElectricAircraft.com makes no representations about these companies, products, services and websites which are not maintained, controlled or created by Aeroval, Inc./MoreElectricAircraft.com, and does not endorse any linked websites or the information appearing on 3rd party websites. 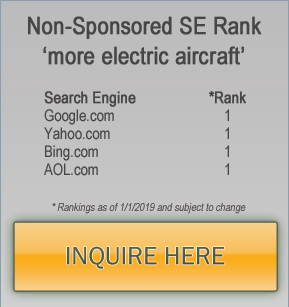 Advertising and links from MoreElectricAircraft.com do not imply that Aeroval, Inc./StarterGenerator.com ® endorses, is affiliated with, or is associated with such companies, products, and websites. Additionally, Aeroval, Inc./MoreElectricAircraft.com is not responsible for products/services purchased and content/information gained resulting from the use of advertisers, hyperlinks, and other third party transactions, originating from our website. It is the consumer and buyers responsibility to qualify goods/services/information and take necessary precautions to protect themselves from harmful elements such as computer viruses and other items that may cause damages. © 2019 MoreElectricAircraft.com - All rights reserved.